Gift cards and their brethren (reward cards, loyalty cards, rebate cards) are often tucked into forgotten side pockets of wallets or tossed around with the spare change at the bottom of a purse. Never visible when needed at the register, they lie there, lonely and unused. Worse yet, expired. It’s like throwing money out the window. With Card Cubby, you can keep these cards close at hand, alphabetized, organized, and ready to go. Other filing systems are primarily for coupons. But, Card Cubby was specifically designed, in stature and shape, for storing cards. Wendy Krepak developed the wallet-sized solution so she could locate her own lost cards floating in the depths of her bag. Card Cubby also fits neatly in a desk drawer, console, or glove compartment. It works well for business cards, receipts, movie tickets and regular credit cards too. In bright fun colors, it holds approximately 40 plastic cards or 80 paper ones. 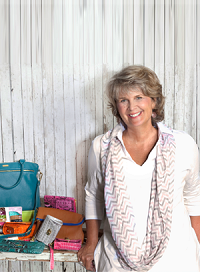 My name is Wendy Krepak and I am the creator of the Card Cubby. One too many times in the checkout rooting for my gift, loyalty and frequent buyer cards while others shook their heads in frustration sent me looking for a solution! With its rolodex style alphabetized system your cards are where you need them when you need them... saving money and time! You will want to do a happy dance each time you get a free coffee, manicure or sandwich because you used your loyalty cards! Get a Card Cubby and ask everywhere you go if they have a loyalty card and let the savings begin! I am honored to be a part of this launch and am here to answer any questions you might have. They are 5 x 3 x 2 and can replace your wallet as they have a zipper for money and a place for an ID or be used in addition to a much smaller wallet! Help! And thanks in advance!! @Guest Hello! Remember the bright colors are easy to find in your purse! I am so glad you are excited! You will love it! @Wendy Can you tell me what color I'm looking at in the one with the three? Thanks! @Pamela Hello! I am not sure what you are asking? The photo above is grey mist, tropical teal and passion pink. @Wendy Thank you, Wendy. I just thought the one w/the 3 looked beige-ish, and that the stand alone was a grey. Think you guys will ever make a beige-ish one? Thanks again! These look so cool, but I need a certain color to put the finishing touches on a wedding present! Awesome idea! Do you have an RFID protected Cubby for Credit cards? That would be a great companion to this. @Guest Right now we are selling these on The Grommet, for if you'd like to get in touch with me about other options, contact The Grommet Customer Experience team. You can reach them by phone at 877-862-0222 or via email form here. do not need protection. Thanks!! Any way this product can be made in the USA? @Joan Sorry Joan but not unless the consumer can pay double as that was the price we have gotten in the U.S. We tried!! I've just placed my order & can't wait until I receive it! 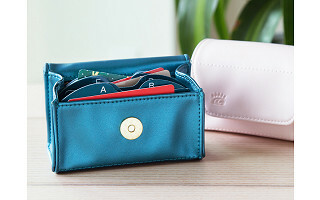 I have been using one of the small security wallets - but it is so hard getting the cards in & out of the plastic holders - your cubby will work so much better- much quicker & still small!! Love It! @Debra Hello! The Card Cubby is so easy to use! Like a rolodex in your purse! Greetings...I am a long-time Card Cubby lover. I think I am on my second and purchase them for teachers every year at Christmas and they were my favorite stocking suffers one year. I keep in my purse at all times with my gift cards and loyalty cards and I agree that bright colors are easier to find in my purse! After years of searching all over my purse for the card I want, I know longer do that...they are right there in alphabetical order. I hope others will love these as much as I have! parents love us! Cubbies make great gifts and some people buy them and make a gift card basket like for a baby gift they add a Starbucks, Target, Massage.. gift card! The recipient gets the cards and keeps on using the Cubby! Can you tell me what colors I'm looking at in the picture where are there three? Thanks! @Pamela Yes! Grey Mist then Tropical Teal and Passion Pink. Let me know if you have further questions and thanks for your interest! I purchased one of these online from another company about 4 years ago after seeing one in use. 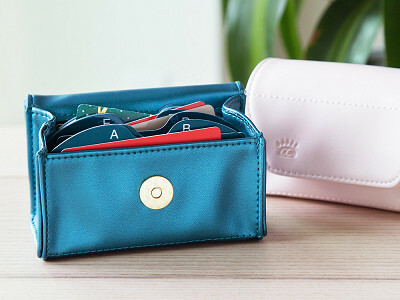 They really are handy for keeping all your cards organized. @Guest so glad you are enjoying your cubby! Hi, I couldn't find another place to email Grommet, but just want to point out an English usage error in the Cubby description: "Never visible when needed at the register, they lay there, lonely and unused." The correct word is "lie" there. Thank you. Felicity B. @Felicity thanks for the heads up! @Felicity Grommet CEO here...thank you for your eagle eye. We fixed the grammar error. I am so disappointed, I wanted to order three of these card cubbies, and you don't ship to Canada. @Guest Hello! We may be able to in the future, but in the meantime, contact the Grommet customer experience team and they will walk you through how to ship internationally. I usually carry my cards in a RFID wallet. I like your idea with the Card Cubby and want to get one but dont want to give up my RFID protection..
@Guest Hello! Right now we are selling this option on The Grommet, but please contact the Gromme Customer Service team and they can get you in touch with more for further options. @Guest hello! We don't currently ship to Canada but see below, the Grommet team can give you some suggestions. Amy from The Grommet team here. Thanks for all of your inquiries about shipping outside the U.S. Right now we aren't able to ship internationally, but we work with many 3rd party shippers who will be able to help you ship a Grommet to your international destination. If you begin to enter the foreign address, our system will recognize it and offer some suggestions for which 3rd party vendor you can use. If you have any questions at all, don't hesitate to contact our Customer Experience Team and they will happily walk you through it. Their # is 877-862-0222. @Jamene hello! I know you will love it! Enjoy! Gift cards and their brethren (reward cards, loyalty cards, rebate cards) are often tucked into forgotten side pockets of wallets or tossed around with the spare change at the bottom of a purse. Never visible when needed at the register, they lie there, lonely and unused. Worse yet, expired. It’s like throwing money out the window. With Card Cubby, you can keep these cards close at hand, alphabetized, organized, and ready to go. Other filing systems are primarily for coupons. But, Card Cubby was specifically designed, in stature and shape, for storing cards. Wendy Krepak developed the wallet-sized solution so she could locate her own lost cards floating in the depths of her bag.